Hold on to your caps, this week we cover a variety of topics and disclose some exciting announcements for us here at Land & Legacy! 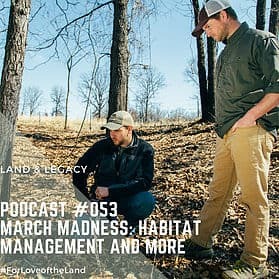 It wouldn't be a Land & Legacy podcast without us talking habitat management, so we share some of the top practices and techniques you can be using right now to improve your land. Don't get cabin fever and sit on couch, this is time of the year land managers need to be preparing for the growing season. In a unique segment in this week's podcast, we take time to discuss how we got here. We answer the question that breaks down our passion for the land and it's natural resources. We address how our education and the processes we have used to continue furthering our education. Searching for answers and thinking outside of the box is a place we hope many listeners can begin to find themselves in. We hope you enjoy this section and push yourselves to further pursue answers. Next PostPodcast 54: Are You Leaving a Legacy?